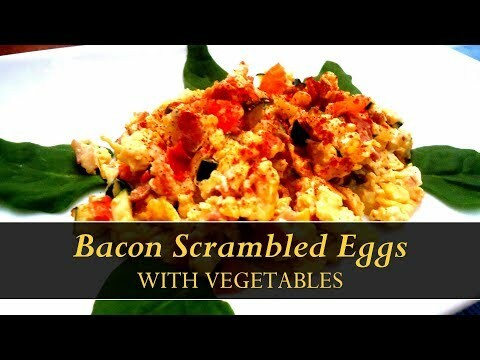 Eggs are a very good source of high quality protein and vegetables provide a source of many nutrients, fiber and vitamins A, E and C. This easy breakfast recipe combines the grounding protein of crisp bacon and fluffy eggs with vibrant, healthy vegetables like zucchini, and spinach. A variety of veggies combined with eggs make a great start to the day. This is one of those recipes that is more about the method, and less about the actual recipe. You will love the combination of Zucchini, bacon and spinach. Meanwhile, wash and chop the vegetables. Heat a pan with one tablespoon of coconut oil. Add the eggs and the bacon inside the pan and cook until the eggs are firm. You can substitute the zucchini with one carrot. This recipe is the perfect way to use up whatever vegetables you have on hand. We Being Fit suggest you to use anything that’s been left behind in your veggie drawer for this quick scramble. As for us this combination is perfection so We Being Fit can’t stop ourselves to share this recipe with you guys. HOPE YOU ALL WILL ALSO LOVE IT.